So we had an uninvited visitor last night. In our home the word “tarantula” is used frequently when referring to large spiders. Mostly by me. I hate spiders and they all look too big. Never in my wildest imaginations did I think an actual tarantula would present at my homestead. Never. 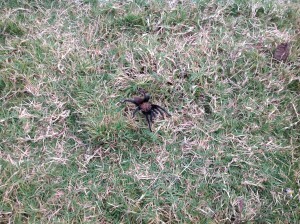 Eric and I looked at each other with the “surrrreeee there is a tarantula in our back yard’ look and headed outside. The scene we walked into is forever burnt into my memory. Consider this your warning because what you are about to read and watch is the stuff nightmares are made of. There was a large ENORMOUS black and brown entity traipsing along the top of the grass. It was furry and meaty and absolutely terrifying, yet I felt drawn to it in some sort of sick way. We all stood there staring at it as it came closer and closer to the back patio. Wait. You saw him last night and let him go? Something isn’t right there. I’m certain of that. I’m going to need to keep an eye on my neighbor. I prefer to think that he had forgotten the way I screamed at the water bug that was by my dumpster this summer and the fact that he had to smash it with his police baton. Because if he did remember, wouldn’t he surely have disposed of it to prevent me having a stroke at its presence? Also, I don’t care how many bugs the thing eats, nothing will ever make me ok with having a TARANTULA hanging out willy nilly in my backyard. After the menace was captured, we did what any normal people who were suffering from a traumatic spider event would do. We paraded him around the neighborhood. I like to think we achieved a level of LCS (local celebrity status). The kids of the subdivision all thought it was sooooooooo cooooooool. One inebriated fella said it was “wicked – not a purple one, but a black and brown one.” Yeah, we gathered that from the fact that he was black and brown. He went on to tell us that the purple ones are great – they climb all over ya, but the black and brown variety can give you a real bad rash. 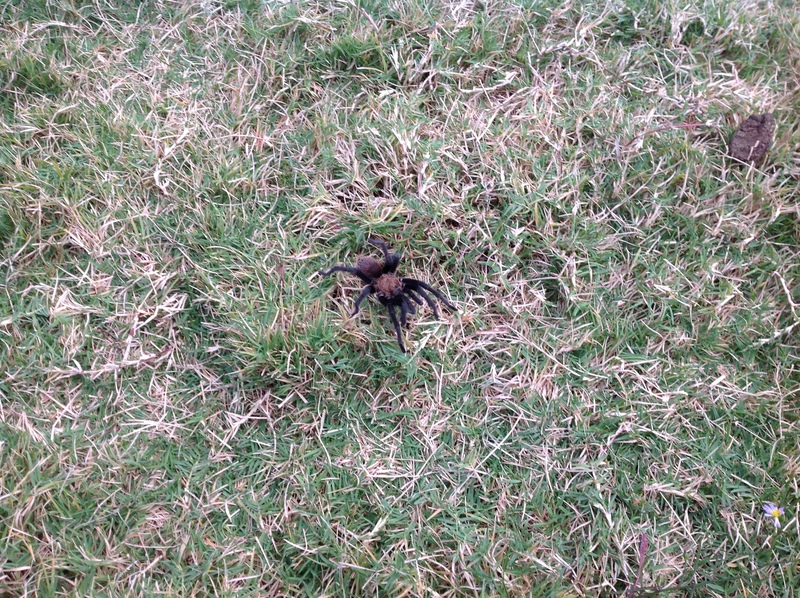 Okey Dokey, moving along……..
One couple even googled info about tarantulas for us during their evening walk and then quizzed us as they passed us again. YES! All spiders are venomous, but their fangs are so small they cannot hurt toooo bad. NO! They may hurt real bad, or even make you sick, but you no one has died as a result. Of course there is the chance of allergic reaction, but that’s not too common. We finally reached the woods to release our little 15 minutes of fame maker and wish it the best in life, away from our home. The following video will serve as my conclusion. I have not been out back today. I don’t know that I’ll be going out back any time soon. Between the fire ants, the stinging caterpillars and now the tarantulas, I may just call it a season and remain indoors until I can close my eyes and not see its creepy little fangs. 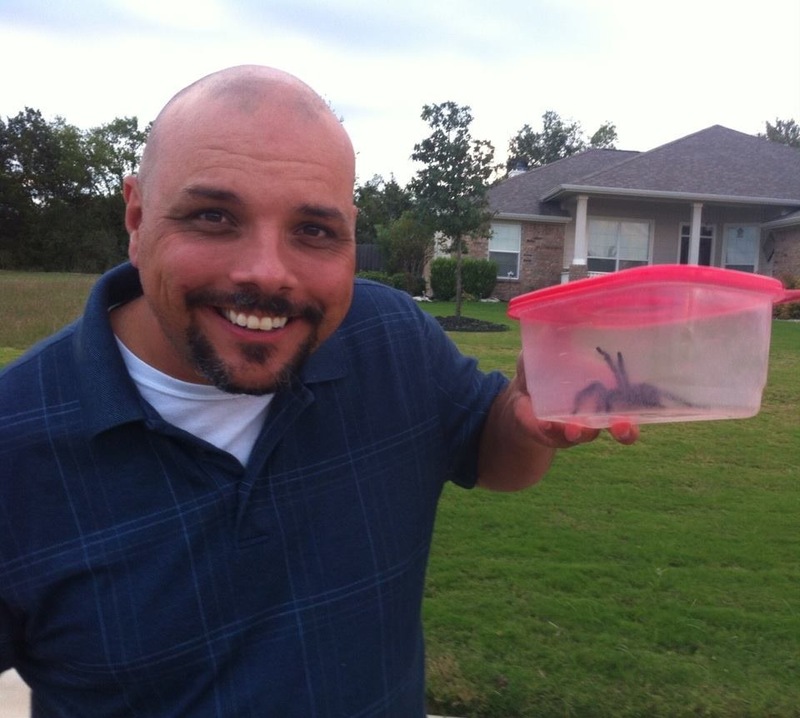 Here’s to you Mr. or Ms. Tarantula, have a great time scaring the crap out of someone else. Stay the heck away from us because if you come back I will not stop Michael from killing your creepy self again. If you need a good laugh, click the link. It goes to the aforementioned video. Previous PostPrevious Love people in carline? Next PostNext Older, Wiser or Lazy?? ?